Gasco .... signs agreement with Jipco. Abu Dhabi-based National Gas and Industrialisation Company (Gasco) has entered into a partnership with Juffali Industrial Products Company (Jipco), a services provider for the Mercedes-Benz range of commercial vehicles, to purchase additional 100 Mercedes-Benz Trucks to expand its gas transportation fleet. The agreement signed by Eyas Al-Hajeri, CEO of Gasco; and Emad Rasheed Dafterdar, director of marketing and sales for trucks and commercial vans, Jipco, will contribute towards increasing the reserves of each of the company’s branches around Saudi Arabia, said a company statement. Salman Al-Jishi, chairman of Gasco, stressed the importance of the agreement and noted that it will positively impact the company’s performance and customer satisfaction in the levels of end consumers and authorised distributors. “We have signed this agreement for 100 truck bodies in line with the special specifications that meet the company’s standards in the security and safety of transporting hazardous substances,” he added. It is noteworthy that Gasco places the highest safety standards for all equipment used to transport gas, and safety tests are routinely conducted. 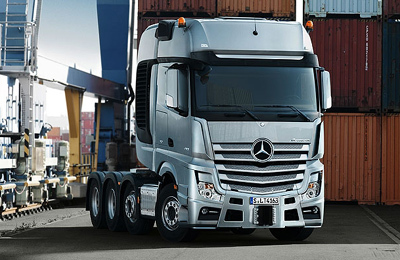 These measures correspond with the specifications of the Mercedes-Benz Trucks which provide all features necessary for the work and specification requirements from Gasco. Mercedes-Benz Trucks are the best in class worldwide; they meet Saudi and GCC specifications, and are equipped with the highest levels of security and safety.